Specialty CME Credits: Included as part of the 4 credits, this CME activity is eligible for 4 Infectious Disease CME and 1 Pharmacology CME credits, subject to your state and institutional approval. Diphtheria, pertussis, and tetanus are potentially deadly bacterial infections that are largely preventable through vaccination, though they remain in the population. 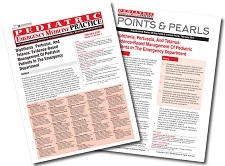 This issue reviews the epidemiology, pathophysiology, diagnosis, and current recommended emergency management of these conditions. Disease-specific medications, as well as treatment of the secondary complications, are examined in light of the best current evidence. Resources include obtaining diphtheria antitoxin from the United States Centers for Disease Control and Prevention and best-practice recommendations with regard to testing, involvement of government health agencies, isolation of the patient, and identification and treatment of close contacts. Most importantly, issues regarding vaccination and prevention are highlighted. A panicked mother rushes into the emergency department, screaming that her baby is not breathing. Taking the apneic infant from her, you hurry to the resuscitation bay. Within seconds, the infant begins to breathe spontaneously. You provide supplemental oxygen by face mask as the team attaches leads and obtains vital signs. The monitor shows a respiratory rate of 30 breaths/min, heart rate of 140 beats/ min, and oxygen saturation of 98% on room air. As you note a rather unremarkable physical examination, apart from occasional gagging, his school-age sibling begins coughing. Does this sibling’s apparent upper respiratory illness have anything to do with your patient’s condition? You consider the infectious processes that could present with apnea and the key historical questions you should ask the mother, and you begin to plan your next step in the assessment and management of this baby. 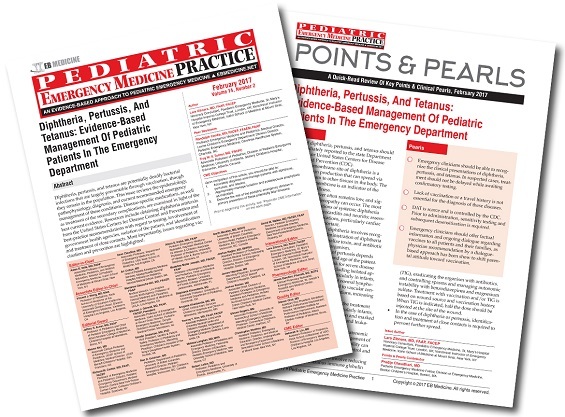 After reading this article, I have increased awareness of Diphtheria, Tetanus and Pertussis and use of diagnostic studies, therapy and surveillance, including PEP to appropriate individuals.